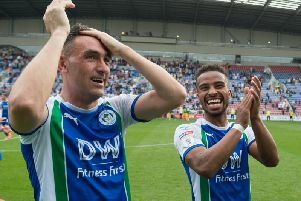 Gary Caldwell insists no-one at the DW Stadium will be getting carried away despite Wigan Athletic appearing to have one foot in the Championship. The 1-0 victory over Coventry - Wigan’s fifth on the bounce - extended the unbeaten run to 20 matches. It also opened up a four-point lead on second-placed Burton, and a 10-point buffer to third-placed Bradford with only five matches to go. However, the manager is taking nothing for granted - and says the only focus is on setting even higher standards in the last month of the campaign. When asked how easy it would be to keep collective feet on the ground, Caldwell replied: “It’s not difficult at all with this group. “They want to work hard and improve, and it’s my job to facilitate that, and show them where they can improve. “Analysing this game, there’ll be areas we can improve, and the challenge is to do that in training next week. “It is still a work in progress, but I feel the potential in this team is absolutely massive. “I say it every week, but I firmly believe we can get even better. “The players themselves believe that, and they want to get better, which is great for me as their manager. “I see their hunger every day to come in and want to improve as players. When asked whether he was more pleased with the four-point gap to second or the 10-point gap to third, Caldwell added: “I’m just pleased to be winning games. “And I’m pleased to see the progression in the standard and quality that this team are playing with. The feel-good factor around the club had been shown on the morning of the game, when the 3,047 allocation for the trip to Blackpool on April 30 were sold out by dinnertime. “I think the Beatles sold out in three-and-a-half hours - we sold out in three hours for Blackpool,” Caldwell smiled. “It’s fantastic for the club, and it’s great for the fans that they have a club they can be proud of, and a team they want to come and support. “We’ll do our very best to keep winning up to then, and then obviously on the day give them a really good day out.